Mimulus guttatus. Things may look innocent, but this picture actually captures a heated battle between different plants, males and females, and even alleles of the same genes! Reproduction is a fundamental property of evolving organisms. Because it is the key determinant of fitness in eukaryotes, reproduction is intuitively view as a conserved and cooperative process. Yet, reproduction is actually riddled with opportunities for conflict--between competing individuals, males and females, parents and offspring, and even genes in the same genome! 1) How does the evolutionary process of reproductive conflict shape genomes, phenotypes, fitness, and populations? 2) What is the genetic basis of phenotypic differences that contribute to variation in reproductive success, adaptation, and speciation? We complement genomic studies of natural populations with genetic crosses and experiments in the laboratory and natural settings. 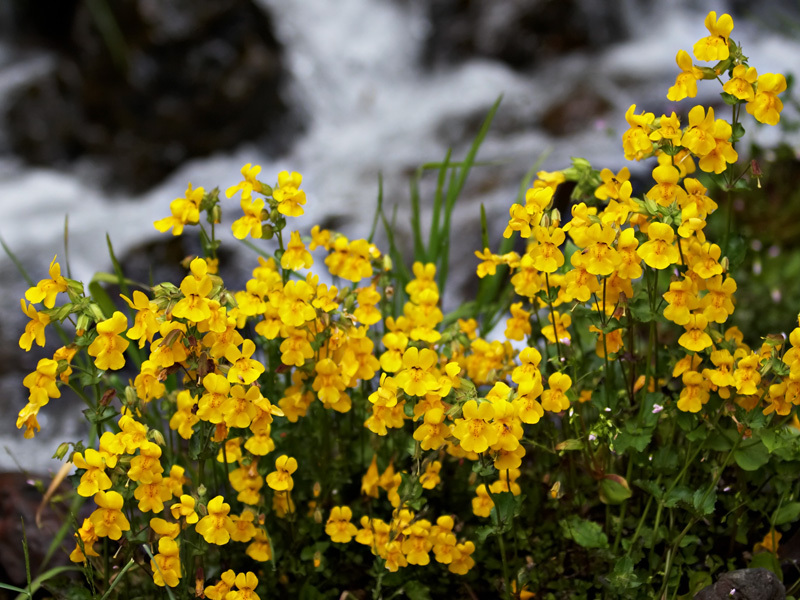 We currently focus on Mimulus--a California native wildflower that is incredibly diverse (not to mention adorable...). This integrative, quantitative approach promises novel insight into the maintenance of genetic variation, the processes of divergence and adaptation, and the evolution of the genome itself.